Amma is the biography of an extraordinary woman, an internationally revered spiritual leader and a powerful force for good. Her official name is Mata Amritandamayi, meaning Mother of Immortal Bliss. She is more commonly know as Ammachi or Amma, Mother. Considered as a living saint and sage by millions in her own country of India, Amma travels the world and her followers number hundreds of thousands. Judith Cornell first met Amma in 1987 and has followed her progress ever since. 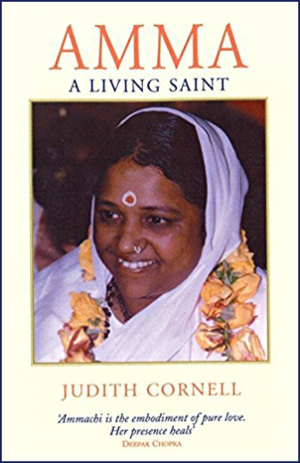 She writes about her subject with insight, warmth and clarity: Tells the story of Amma's birth, her harrowing childhood and her divine calling to alleviate the sufferings of humanity; Highlights her rise to prominence as a respected, international religious leader and great humanitarian who has founded schools, orphanages, ashrams, a hospital, has set up pensions for destitute women and is now building 25,000 free homes for the poor; Includes touching stories of the many miracles Amma has performed and the people whose lives she has transformed; Reveals the gruelling daily life of this modern saint and arduous world tours she undertakes. JUDITH CORNELL Ph.D. is the award-winning author of MANDALA:Luminous Symbols for Healing. Since a radical awakening in 1979, she began pioneering a method to help others to awaken and heal at the deepest levels. Her method blends the sacred art and the spiritual science of the mandala with theories in quantum physics, raja and kundalini yoga, and transpersonal psychology. Dr. Cornell is a classically trained yogini of the Hindu non-dual Saivite tradition. She is founder and director of Mandala Facilitation Trainings. Her life is dedicated to giving webinars, retreats and workshops that support awakening of one's true Self. She is also the author of The Mandala Healing Kit, Amma: Healing the Heart of the World and Drawing the Light from Within.